Piece of Blue Entre deux (Entredeux) shown. The Right side of the entredeux is smoother than the wrong side and is slightly raised. There is a fabric selvage on either side of the entredeux. Entre deux means "between two". It is used for stability between two materials. It is also decorative. In this Lesson, the entredeux will be sewn to fabric, in preparation to sewing lace to the sleeve edge. So the entredeux will go between the fabric and the lace (however, the lace will not be attached in this lesson). Pin Entredeux to fabric, right sides together and raw edges even. Pin the Entredeux to the Fabric. Be sure to trim the entredeux selvage if necessary to match the seam allowance of your garment. The seam allowance for this sleeve is 1/4". The entredeux did not need to be trimmed. But you must measure each entredeux because the selvages can differ. Stitch right next to the Entredeux (on the side toward the raw edge). 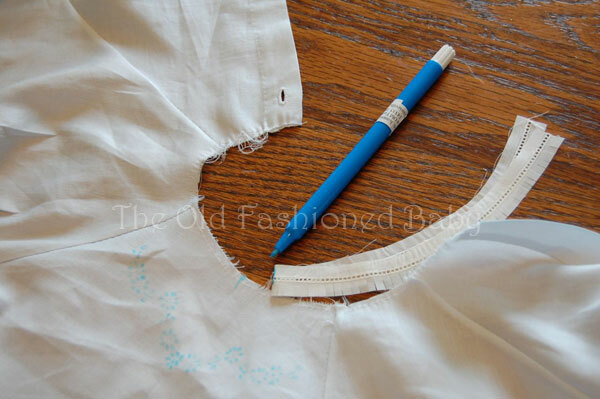 You can stitch this by hand with small Running Stitches or use the sewing machine. I like this method of attaching the entredeux to fabric, so many of the Old Fashioned Baby patterns use this technique. Here you can see the wrong side of the fabric as well as the right side that has already been stitched. Be sure the needle goes through all the layers. Never trim the Entredeux selvage. 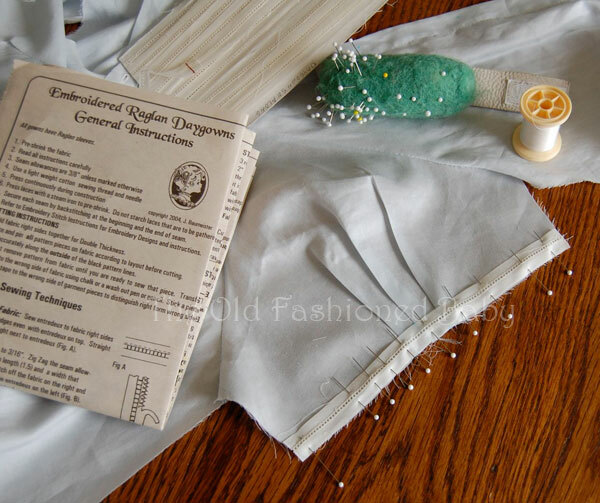 After the entredeux is attached to the fabric, trim the seam allowance of the garment fabric to a scant 1/8". Here you see the entire seam allowance of the garment fabric trimmed to 1/8". Finger press the entredeux away from the fabric. You will be pressing the seam allowance toward the wrong side of the garment. 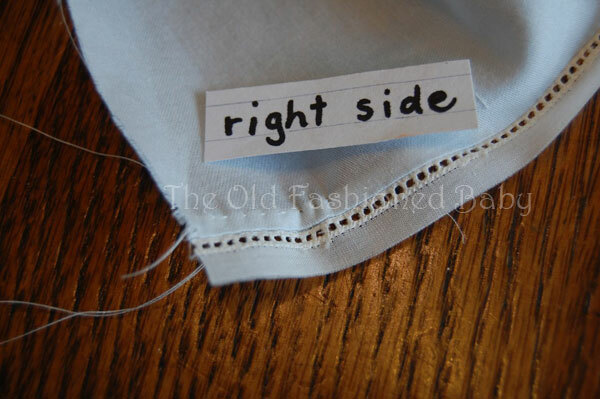 On the wrong side of the garment, turn under the raw edge of the entredeux selvage to enclose the trimmed raw edge of the fabric seam allowance. 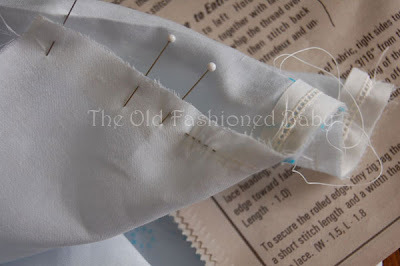 Pin, then stitch in place along the folded edge using a small running stitch and fine needle and thread. I use DMC #50 thread and a size # 11 Sharps needle. 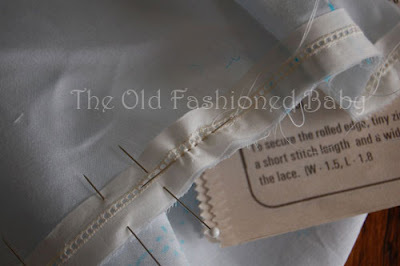 Always stitch this by hand, even if you did the first stitching by machine. 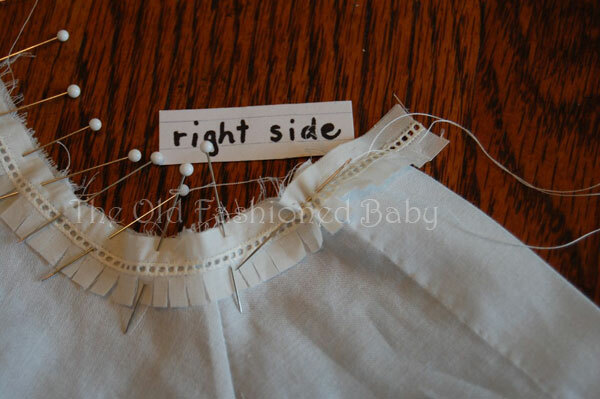 Right side of garment with the Entredeux sewn to the fabric. 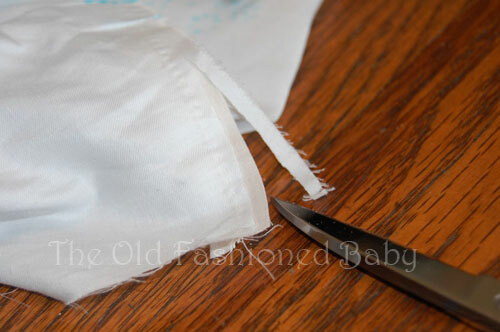 You will trim away the remaining entredeux selvage when you are ready to stitch the Lace edging to the Entredeux. Entredeux to a Neck Edge. Clip one side of the Entredeux selvage, clipping every 1/8" to 1/4". Spray starch the entredeux and then press it into a "smile". Fold the entredeux in half and mark the center. Stay stitch your neck edge. To do this, stitch inside the seam line. Mark and match the center of the Entredeux to the center of the neck edge. Match the centers as you begin to pin. There should be 1/4" of entredeux extending from either side of the neck edge. 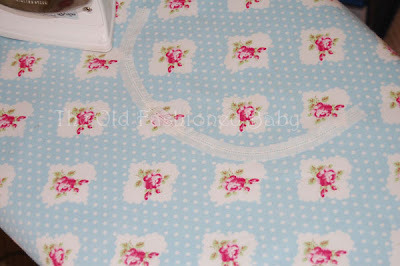 This will be turned under once the lace edging is attached. Pin the entredeux to the neck, right sides together, raw edges even. Be sure the facing is stitched in place before attaching the entredeux to the neck. The neck edge must match the entredeux (which has been cut to fit the garment). Do not cut the entredeux larger to fit your neck edge, if the neck edge is too large. If the neck edge is larger than your correct entredeux measurement, pull up the staystitch thread to ease the neck in to fit the entredeux. 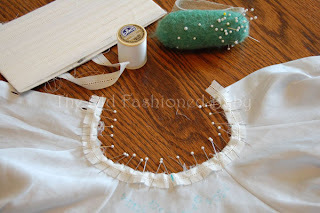 If the neck is too small to fit the entredeux, clip the staystitch thread and smooth it out to stretch the neck slightly. 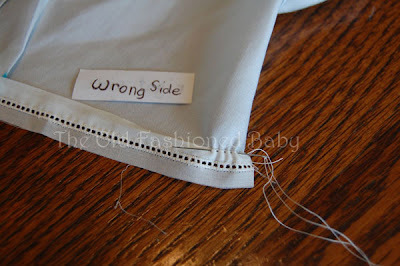 If there is a large difference between the entredeux and the neck measurement, you have stitched the seams of the shoulders incorrectly, not following the given seam allowance. 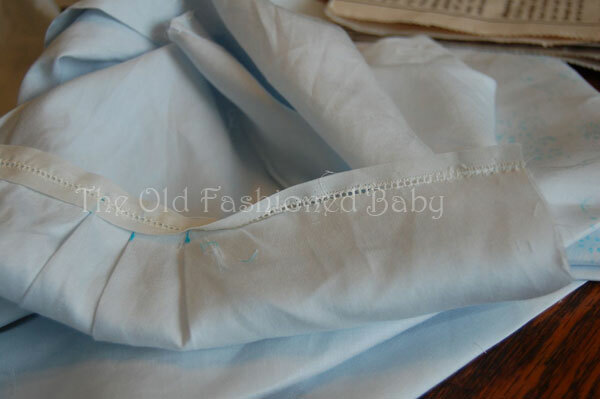 Stitch the entredeux to the fabric by hand or machine. Finish in the same manner as before.